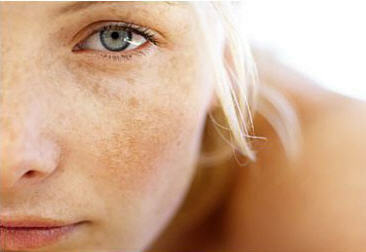 Blotchy skin often appears as red or blown patches on the skin due to sun damage. Besides, this hyperpigmentation or uneven skin tone may be caused by factors like intake of certain medications, genetic predisposition, hormonal changes because of stress, aging, excessive acne, rosacea, and so on. Although treatments like microdermabrasion, bleaching, and chemical peels can help you get rid of this problem, you can try some natural cures as well. In addition, when dealing with blotchy skin, make sure you use a gentle cleanser that is perfect for your skin type and exfoliate your skin regularly to remove the accumulation of dead skin cells. Take a quarter cup of ground oatmeal, and add six ounces of plain yogurt, two teaspoons of organic honey, and a teaspoon of lemon juice. Use this mixture once or twice in a week to reduce acne and blotchy skin. Scrub your face with a mixture of one tablespoon of oatmeal, one tablespoon of milk powder, and two tablespoons of fresh lemon juice. Leave it on your skin for about 15 minutes and then wash it off with lukewarm water followed by a splash of cold water to close the pores. This exfoliating recipe is particularly useful for oily skin. You can prepare another oatmeal mask for mature, blotchy skin by cooking two tablespoons of oatmeal in half a cup of milk until it becomes soft. Mix two tablespoons of extra-virgin olive oil in it and allow it to cool. Apply this mask on your face and neck, and rinse it off after 20-25 minutes. Finally, wash it off with lukewarm water and follow up with a toner and moisturizer. Here’s a video showing how to make an oatmeal face mask to brighten up red, blotchy skin. In case you have dry skin, use a combination of a mashed banana, half a cup of sweet almond oil, and an egg yolk. Simply applying fresh cucumber juice is highly beneficial for soothing blotchy and sun burnt skin. You may also add tomato juice in it. Aloe vera gel, too, is considered good for blotchy skin. Another beauty-care recipe for dry skin involves using a solution prepared by mixing half a tablespoon of organic honey and two tablespoons of rose water. Blend a few chunks of cucumber in a blender along with a tablespoon of honey, a teaspoon of rose water, and two to three drops of lavender essential oil. Whip an egg white and mix the juice squeezed from half a lemon. Apply this remedy on your face for 15-20 minutes and then rinse it off to get rid of acne, blemishes, and blotchy skin. Soak a green tea bag in half a cup of hot water for about 10 minutes. Remove the tea bag from the solution and add one to two tablespoons of rice flour in it to make a smooth paste. Apply this homemade facial mask regularly to cure red, blotchy skin. Beat an egg yolk, and mix one teaspoon each of orange juice, olive oil, and a few drops of lemon juice and rose water in it. Spread this mixture on your face and rinse it off after 20 minutes. Soak a few almonds in water overnight. Next day, peel their skin and grind the kernels. Add olive oil in the almond paste and smear it on your face. Finally, wash it off after 15-20 minutes to heal dry, blotchy skin.